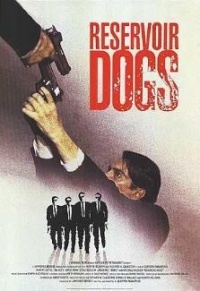 Reservoir Dogs is a 1992 movie written and directed by Quentin Tarantino. Starring Harvey Keitel, Quentin Tarantino, Tim Roth, Steve Buscemi, Chris Penn, Michael Madsen, Lawrence Tierney, and Eddie Bunker. It is Tarantino's first feature motion picture that he wrote and directed. It premiered at the Sundance Film Festival and created quite a controversy. Six men are hired to take part in a jewel heist. Joe Cabot (Lawrence Tierney) and his son Nice Guy Eddie Cabot (Chris Penn) hire the men who are then given colors as names to protect their identities. They are: Mr. Blonde (Michael Madsen), Mr. Brown (Quentin Tarantino), Mr. White (Harvey Keitel), Mr. Blue (Eddie Bunker), Mr. Pink (Steve Buscemi) and Mr. Orange (Tim Roth). After the authorities show up unannounced and the robbery goes bad, the remaining members who make it out alive, suspect one of their own to be an informer for the police.